What's The Best Age Gap to Leave Between Babies? It's an age old question (no pun intended) and one that there is no definitive answer to. When I met Cherry Healy at CyberMummy we chatted about this for a good half hour. I know mums that have 3 children under 2, I know others that have a baby and a teen but what is the ideal age gap? We sat him down and explained "Mummy has a baby in her tummy" His smiley face suddenly changed and his lip began to quiver, "Spit it out mummy...quick!" he cried. Poor Mister A, he thought I'd actually eaten a baby! We didn't mention anything again until after the 12 week scan (although we did explain that I hadn't actually eaten his sibling!) because we wanted to make sure everything was ok. Everything went well and it was then that we decided then that we would take Mister A to our 20 week scan when the time came. We bought some books about becoming a big brother and explained everything to him. Being 3 meant that Mister A understood to a great extent exactly what was going on - he had friends at nursery with brothers and sisters and he was excited to be getting one of his own. 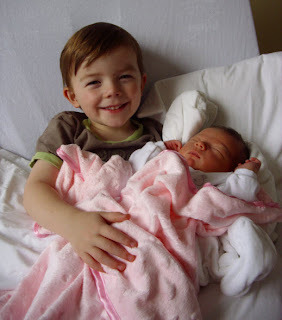 For the next few months we talked about how the baby was living in mummy's tummy, we wondered whether we would have a baby brother or sister and we let Mister A help with some of our baby purchases. He was so excited and would kiss my bump goodnight each evening. We involved him at every stage and at no point was there any feelings of anxiety or jealousy about the impending arrival. By the time the 20 week scan came around, Mister A was sooo excited to find out what 'flavour' baby we were having. He had expressed a want for a brother but we explained that it could be a sister too. There was a 'but I don't want a sister moment' as we travelled to the hospital on the day of the scan but when the sonographer told him he was going to have a sister he was beaming. As the weeks passed Mister A grew even more excited, we brought some books about becoming a big brother and he would tell literally everyone we met that "I'm going to be a big brother soon". Mister A's age meant that he understood what was going on and we could invlove him in decisions to make him feel included. On the day I was induced he went to stay with Grandma but he knew that once his baby sister arrived he could come in and meet her that night. Luckily Little E was aware there was a big brother waiting to greet her so she had bought him some small Ben 10 gifts and written him a 'Best Big Brother' card. Mister A was VERY impressed and quickly handed over her baby teddy and a hand-made card. There were lots of visitors for Little E and luckily everyone brought Mister A a small gift too so there was no resentment on that level. When we all returned home in the car he announced "Mummy, Daddy, I'm glad I have a sister, I'm not lonely in the back on my own anymore." I cried - well I was riddled with hormones - but we've been a happy little family ever since! As the weeks passed Mister A enjoyed chatting to Little E telling her what he was doing at nursery and whenever I was breastfeeding we'd sit down and read a story together so he didn't feel excluded. There was a brief period where we had a couple of wet beds at night but that was the extent of any kind of unsettled behaviour. Almost 1 year on, Mister A loves his sister so much and the only problem we have is that he just wants to hug her and play with her ALL the time. That is why my friends, 3 and a half years is THE king of age gaps. I'd love for you to share your 'best age gap' posts too - leave your links in the comments box!! Men in Short Suits - Eeeek!